Alumni and students gather for a photo at the 2018 Mocktails event. Student Alumni Council (SAC) stays busy each semester providing programming and events for students to connect with alumni and each other. The first two events listed below are looking for alumni volunteers while the following two are events SAC hosts each year that raise money for scholarships and allows for SAC to gets its name into the Redbird community. The group hopes its alumni can give back time and talent to attend one of the four! Student Alumni Council is hosting its second annual Mocktail Hour: A Networking Event on Tuesday, April 16, from 5:30–7:30 p.m. This event includes a panel featuring Illinois State alumni discussing the importance of networking for professional development, followed by 30 minutes of guided round table discussions with alumni. The event will finish with 15 minutes of open conversation. Free headshots, appetizers and mocktails will be provided. The event is located at the Hancock Stadium Club on the second floor of Hancock Stadium. Professional headshots will be available for free during this event, professional attire is encouraged. This free event is an opportunity for both students and alumni to develop networking skills and connect with new people. Student Alumni Council is looking for alumni volunteers to attend this event. As a guest, alumni will be asked to speak to students with varying majors and career interests. Students will be encouraged to ask about alumni professional life thus far and the career journey after graduation. Those interested in attending as an alumni guest and networking with current students can contact Julia Gramont, Alumni Engagement graduate assistant, for more information. Illinois State men’s basketball has teamed up with Student Alumni Council to host a Senior Night celebration on Wednesday, February 27. This game is the last chance for graduating students to attend a game in Redbird Arena. SAC students will be giving away T-shirts to all graduating Redbirds. SAC is looking for alumni to volunteer at this event starting at 5:45 p.m. This is a great opportunity to talk to graduating students about getting involved with alumni networks and with Illinois State in general. Those available to attend the game can contact Julia Gramont, Alumni Engagement graduate assistant, for more information. SAC Valentine’s Day 2018. From left to right: Laura Ledin, general council representative (back, left); Julia Gramont, graduate advisor; Casey Weeks; Megan Cain, president; and Richard Greenfield (front). 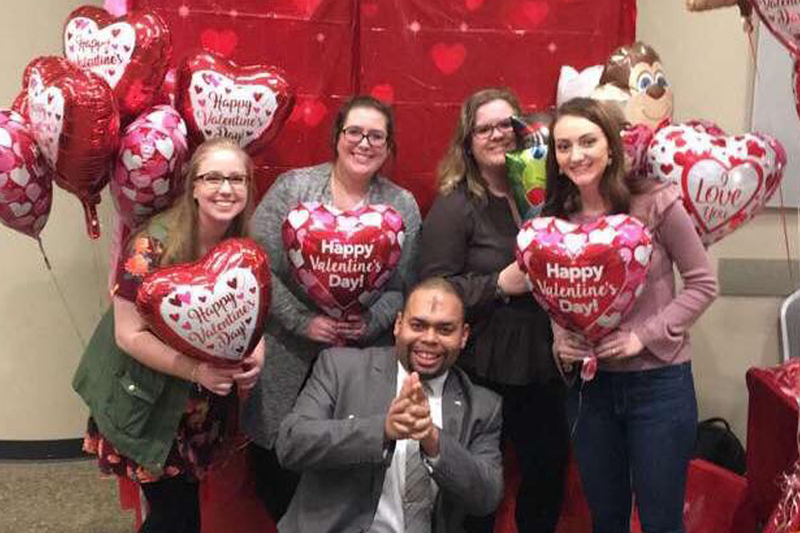 Student Alumni Council is hosting a Valentine’s Day fundraiser Thursday, February 14, from 10 a.m.–2 p.m. SAC members will be in the Bone Student Center selling balloons, flowers, and Polaroid pictures, and raffling a special gift. SAC members will be stationed on the second floor of the Bone Student Center. All proceeds go toward the Illinois State University Alumni Association legacy scholarship. This scholarship is made possible each year by a donation from the family of Marion H. Dean ’27 and continuous contributions from SAC and the Alumni Association. A SAC tradition, the Siblings Carnival! From left to right: Stephanie Duquenne (director Alumni Engagement), Leia Atas (Alumni Engagement intern), Lauren Hardy (associate director of Alumni Engagement/SAC advisor), and Julia Gramont (graduate advisor). Starting planning those trips to Illinois State for Sibling Weekend on April 12–14 as there will be many fun, family-friendly events for all ages happening. Events and information will be posted on the Sibling Weekend website in late February. 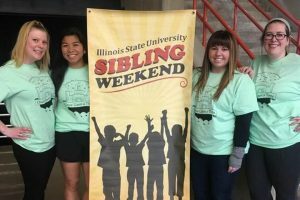 Before the Saturday matinee, Student Alumni Council invites students and siblings to attend the eighth annual Sibling Carnival. This popular Sibling Weekend tradition is kid-approved and open to everyone that has a youth ticket to the matinee show of the Gamma Phi Circus. The carnival includes a variety of games, face painters, prizes, and fun for kids of all ages. Sibling Carnival begins at 10 a.m. on Saturday, April 13. Tickets for the general public will go on sale February 14.